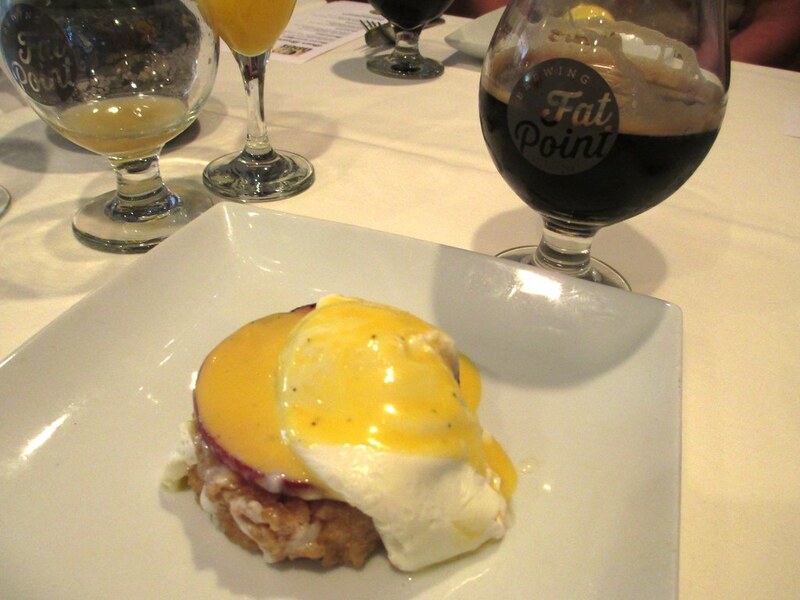 Beer Brunch with Fat Point Brewing and OPUS Restaurant in Punta Gorda, Fla.
Home » Culinary Travel » Beer Brunch with Fat Point Brewing and OPUS Restaurant in Punta Gorda, Fla.
You read the headline right. 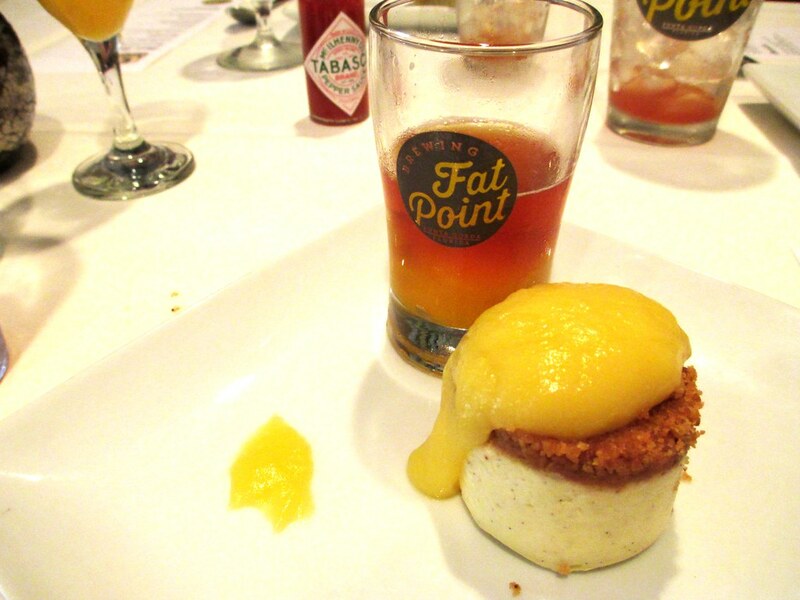 I recently attended a beer brunch featuring craft beer from Fat Point Brewing at OPUS restaurant in downtown Punta Gorda, Fla. I’ve attended wine dinners where wine is paired with an entrée and I’ve attended my share of wine tastings but attending a beer brunch was a first. 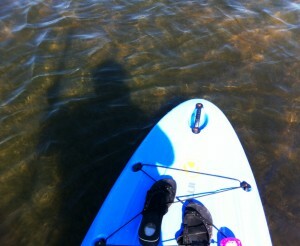 I have to say, it was pretty marvelous and I’m hoping more beer brunches are in my future. OPUS Executive Chef Jason Van Marter created the artfully delicious menu and the beer selections paired surprisingly nice. I mean, under normal conditions, who would drink beer with eggs? 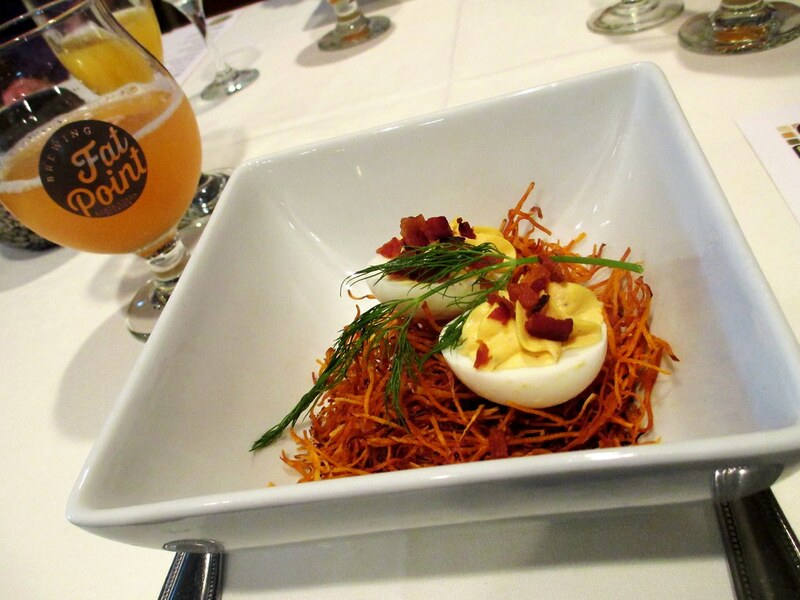 Prior to each entrée was served, Bill Frazer, Fat Point Brewing’s Brewmaster, described each craft brew, the process it was made, and the meal it was paired. Based solely on appearance, this was my favorite course because the visual presentation was fun! It looked as though the deviled eggs were resting in a nest of sweet potato shreds. To add a pop of color from the neutral colors of the sweet potatoes, egg halves and bacon, a green dill sprig accented the dish. As for the Lemon Mint Grapefruit Beermosa, it was a surprisingly happy marriage of grapefruit juice and Fat Point’s Lemon Mint Belgian Wheat with its light and refreshing flavor. What’s a Florida meal without seafood? The blackened snapper was tender, juicy and seasoned with a touch of blackened heat and rested atop sautéed spinach and tender fingerling potatoes. Lime Crème, a light, white cream sauce, topped the snapper which was accented with bright red roe. And here’s the really fun part – the entrée was accompanied with the ultimate brunch beverage, the Ryeght Angle IPA Michelada, which wasRyeght Angle IPA and Bloody Mary Mix. Because everyone has a different preference for how hot and spicy they like their michelada, horseradish, spices, and hot sauce were served on the side so guests could control the amount of heat. As a side note, I like my savory beverages spicy and this cocktail was tasty and smooth. I really didn’t know I was drinking beer. Note: A michelada is Mexican cocktail of beer, tomato juice, lime juice and seasonings. The presentation of this creamy dessert mirrored the Benedict. 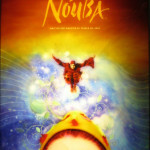 Take a look above. The cheesecake was on the bottom with the sweet crust atop that and the orange curd topped it all off. A beer float rounded out this dessert and was one of those, “why didn’t I think of that?” moments. It was so simple yet so clever. A small scoop of sweet mango sorbet swam in a double shot of Big Boca Ale, a light, crisp ale. 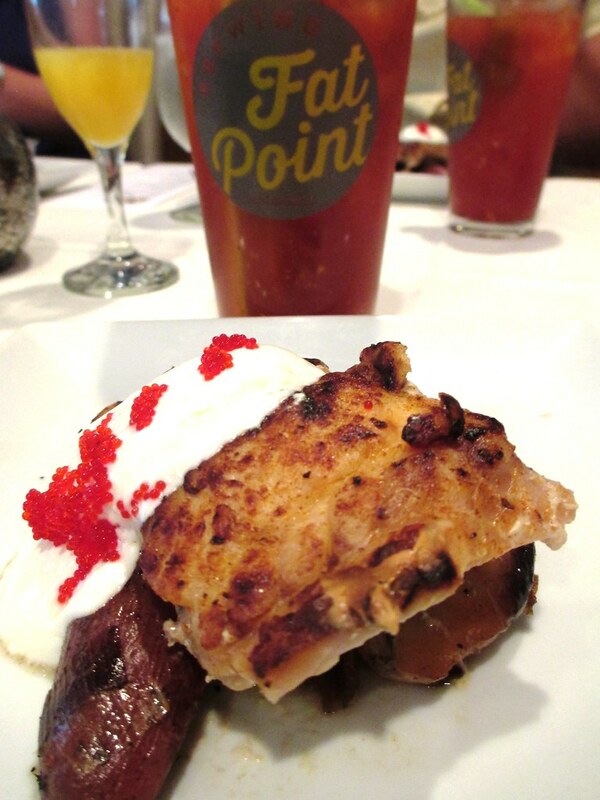 This beer brunch was an awesome way to taste what Fat Point Brewing is crafting and I cannot wait for the taproom to open and their distribution expanded. This tasting meal was also a fun way to see and taste the culinary talents of OPUS’s chef. 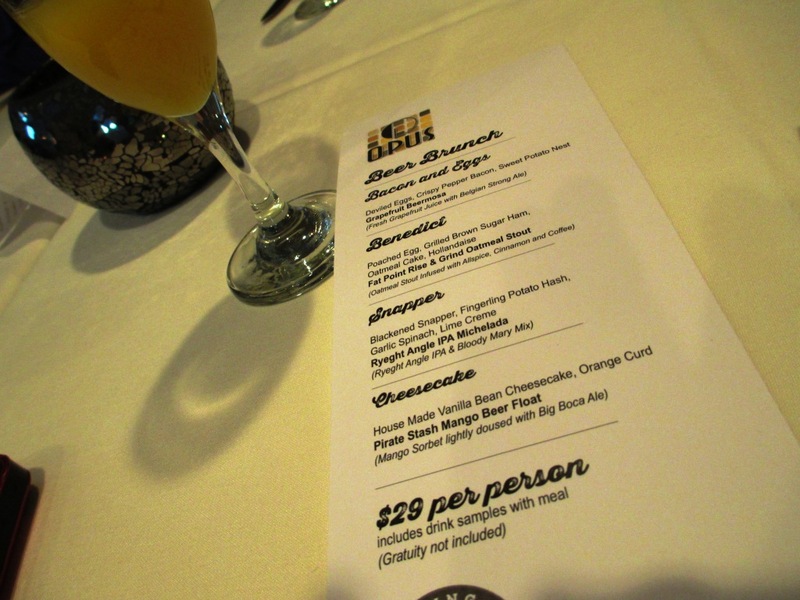 Have you ever attended a beer brunch? Fat Point Brewing is targeted to open its taproom later this summer and the four-course brunch served up a preview of some of the brews. At the time of this blog post, OPUS is one of the few Southwest Florida restaurants and/or bars currently serving Fat Point craft beer.